Sikkim Krantikari Morcha (SKM) expressed that the ruling Sikkim Democratic Front (SDF) party has been busy in explaining the universal definition of unemployment rather than solving the problem. The SKM asserted that it was not necessary to define unemployment but the need of the hour was to solve the problem. 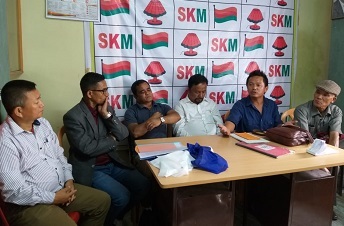 SKM spokesperson Jacob Khaling said this while responding the press statement of the SDF party on unemployment, organic mission and Limboo-Tamang seat reservation issue in a press conference here on Wednesday. He further stated that SKM would solve the unemployment problem within 100 days of formation of Government in the State. On Sikkim Organic Mission, Khaling stated that the Sikkim Organic Mission was the “most unsuccessful and mismanaged mission of the country”. Khaling stated that the “unsuccessful mission” has compelled farmers and businessmen to come out to the streets to protest it and even farmers were taken to the police stations for the first time due to this mission. He added that such mission should be in the interest of farmers, consumers and retailers. “We are totally against SIMFED which has been taking all profits without any hard work but just by working as a middleman. SIMFED is working against the interest of farmers, consumers and retailers,” he alleged. He said, SIMFED is not just to take profit of farmers by working as the middleman but to open outlets for farmers in every corner of the State. He added that if the SDF party was sincere regarding the issue then Limboo and Tamang could have fought the 2004 election in their reserved seats. He added that it was a central issue but the Central Government reserves seats on the basis of recommendation of the State Government. On the same, he alleged that due to wrong recommendation of the State Government, these communities have been deprived of their seats. Khaling also urged the ruling party to give the right formula and suggestion to the Centre then blame the Centre for the delay.